Liberia has seen a significant reduction in the number of new Ebola cases, the medical charity Medecins Sans Frontieres (MSF) has confirmed. It said one of its treatment centres in Liberia has no cases at all at the moment - but warned Ebola was still on the rise in Guinea and Sierra Leone. MSF, which employs thousands of staff across West Africa, is seen as the best-informed authority on Ebola. Nearly 5,000 people out of about 14,000 cases have been killed by the virus. Chris Stokes, the head of MSF's Ebola response, told the BBC that the decrease in the number of cases in Liberia presented an opportunity for health workers to step up their work. But he said the disease could "flare up" again, pointing to Guinea, where the number of cases is rising again despite two significant lulls. For the disease to be contained, Mr Stokes added, it needed to be tackled in Liberia, Guinea and Sierra Leone at once. 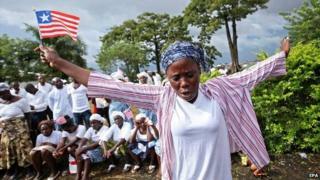 Of the West African countries hit by the 11-month outbreak, Liberia has seen the most deaths. But last weekend its health ministry said two-thirds of the 696 beds in the country's treatment centres were empty. The BBC's Mark Doyle in the Ghanaian capital Accra, where the UN's Ebola response is being run from, says the reason behind the decline of cases in Liberia is unclear. Liberia's government has been running an awareness campaign, advertising the best health practices and installing hand washing stations at buildings across the country. A new 25-bed Ebola centre in Monrovia, which was built by the US army, was also opened by President Ellen Johnson Sirleaf on Wednesday. Despite significant contributions from the US, the UK, China and others, the head of the UN mission charged with fighting Ebola says more help is urgently needed. "There are still people, villages, towns [and] areas that [are] not getting any type of help right now," Tony Banbury told the BBC on Thursday. The World Health Organization (WHO) said on Friday that the death toll from the epidemic had risen to 4,950 out of 13,241 cases in West Africa. "Case incidence is declining in some districts in Guinea, Liberia and Sierra Leone, while steep rises persist in other districts," the UN agency said in a statement. The WHO says at least one in five infections occur during the burials of Ebola victims and issued a guide this week to how best to conduct funerals. The 17-page document provides step-by-step advice to health workers for both Christian and Muslim burials. It includes guidance from a Muslim chaplain that the ritual washing of a body is not needed if that person has died from Ebola.